This blog post aims introducing the topic «crowdfunding» and providing you with some basic information about crowdfunding and the benefit – as we believe – it provides to the entire (sharing) economy. in order to get a clearer idea of the step by step process of crowdfunding. In a seemingly nonstop recession wave, small businesses are struggling more than ever to stay afloat, and entrepreneurs are not facing great odds. Crowdfunding offers these individuals a chance at success, by showcasing their businesses and projects to the entire world. There are numerous crowdfunding platforms where consumers can safely ask for or donate money such as Kickstarter, Indiegogo, 100 Days, c-crowd and We make it, to name a few. While each site offers their unique spin, the general concept is the same across the board. Project creators can create a profile typically containing a short video, an introduction to their project, a list of rewards per donation, and some images to elaborate. The idea is to create a compelling message that readers will be drawn towards. By focusing on a bigger purpose, the driving force behind a brand, project creators will be able to create a unique community of like-minded individuals. Each campaign is set for a goal amount of money and a fixed number of days. Once the project launched, each day will be counted down and the money raised will be tallied up for visitors to follow its success. 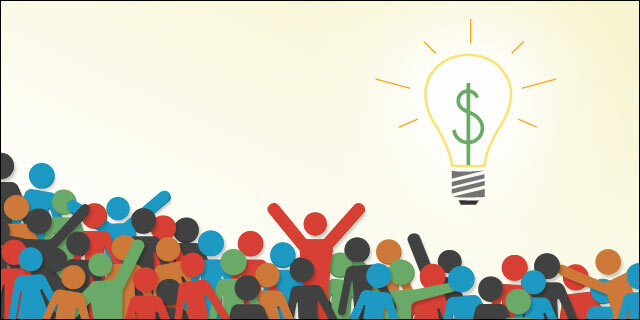 Instead of traditional investors, the general public funds crowdfunding campaigns. Typically, most successful projects receive about 25-40% of their revenue from their first, second and third degree of connections. Those could include friends, family, work acquaintances, or anyone that the owner is connected to, including their second and third degree connections. Once a project has seen some traction unrelated consumers start coming out of the woodwork to support campaigns they believe in. There is a huge misconception that creating a successful crowdfunding campaign is as simple as hitting submit and waiting for it to go viral. While this has happened to many brands, the vast majority of projects will require a decent amount of effort on the part of the project creator. Utilizing social media, creating email distribution lists before the project launches, contacting local media, are all necessary steps to take if you are serious about your goal. Remember, this is not a platform to ask for a handout. If you expect people to join your cause, you had better be prepared to prove your salt. Knowing these points is extremely key to creating a successful campaign. Each campaign should contain a powerful reason behind the idea, exciting and unique rewards, and an eye-catching display. Video definitely plays a huge role in this last point, and novice film makers might want to consider taking the time to ask for assistance from an educated friend, or seeking a crowdfunding platform that assists with the video editing. In this age of the digital reign, many consumers will stop reading your campaign if they don’t connect to the video, so this is the gateway to your proposal. Another common misconception is that crowdfunding is just useful for small businesses and startups. This is untrue. While crowdfunding creates a funding opportunity that certain smaller businesses may not have received in the traditional way, it also is a great outlet for more established companies. These businesses may be interested in expanding their product range, and reverse engineering the investment could be a good idea, not to mention the excitement they can generate before the launch. Crowdfunding has proven itself as a great asset in sourcing potential customers and growing an audience. A great additional benefit to crowdfunding is its economical helping hand. Anything that aids in generating revenue is desperately needed in our sluggard economy, and crowdfunding has proven to be a powerful force. Not only is it pumping small businesses with desperately needed lifeblood, but it is also encouraging entrepreneurs to continue creating even in the face of these slow times. In sum, crowdfunding is a great asset to businesses and entrepreneurs, generating much- needed revenue and increasing the customer base, all the while aiding our country’s economy. Like so many crowdfunding sites greatly located in the cultural and creative sector, but in character 100 Days fits well with many micro-entrepreneurs- and self-employed ideas. The oldest Swiss crowdfunding platform – it’s about social lending. The great Swiss start-Co-investing platform – young companies and private business angels with not too large purse will be merged here. This platform is specializing in crowdlending – loans for businesses. Basically as a platform to build your own crowdfunding site: The individual companies work out here – according to the “White Label” principle – their campaign. Very specialized: A crowdfunding site for the development of games. A crowdfunding platform from the French-speaking part of Switzerland. In principle, for technical or craft projects, but focusing on culture. Another specialty: “I believe in you” is there to fund sports projects – whether top-class or recreational sports. The largest Swiss platform for creative projects – i.e. primarily in the field of culture. There would be access for SMEs if the project is Design-related.